One metering injection system will be supplied for controlling different elements in the feed water of the RO plant. The metering pump will allow controlling of different functions such as the stroke length and percentage rate. The Chlorine Dosing System adds chlorine to feed water source, protecting the system from bio-fouling. Delivers feed water to RO plant at 40~50 psi under required feed water flow rate. Grundfos, Tonakflo or others. 316 stainless steel. Multi-media filtration system is used to filter sand and sediment (turbidity) down to approximately 20 Microns. Both automatic and manual backwash option is available. Corrosion resistant, high performance composite & fiberglass tank will be used to hold the media. Activated carbon filtration system is used to remove chlorine from feed water, which protects TFC membrane from damaging chemical reaction with chlorine. Both automatic and manual backwash option is available. Corrosion resistant, high performance composite & fiberglass tank will be used to hold the media. 5 micron cartridge type sediment filter further reduces suspended solids in the feed water stream to RO system. One metering injection system will be supplied for controlling different elements in the feed water of the RO plant. The metering pump will allow controlling of different functions such as the stroke length and percentage rate. The Sodium Metabisulfate Dosing System neutralizes chlorine, which is added in the feed water to reduce bacteria. The residual serves as an excellent biocide, which prevents membranes from bio-fouling. One metering injection system will be supplied for controlling different elements in the feed water of the RO plant. The metering pump will allow controlling of different functions such as the stroke length and percentage rate. The Chemical Dosing System prevents membrane scaling. One metering injection system will be supplied for controlling different elements in the feed water of the RO plant. The metering pump will allow controlling of different functions such as the stroke length and percentage rate. The Antiscalant Dosing System prevents the membrane from scaling. One metering injection system will be supplied for controlling different elements in the product water of the RO plant. The metering pump will allow to control different functions such as the stroke length and percentage rate. The Caustic Dosing System adjusts product water pH. 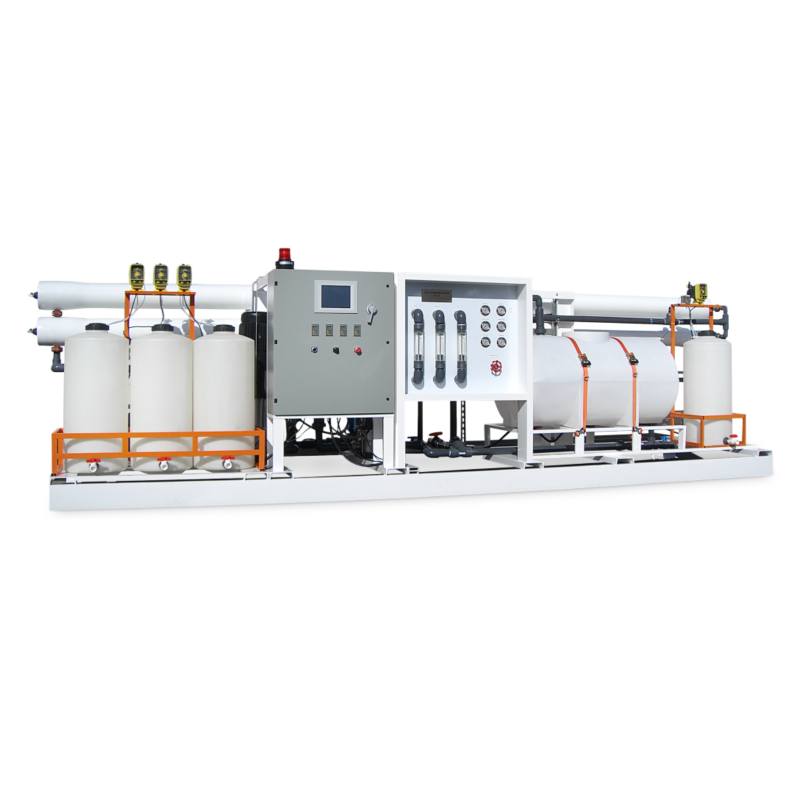 One metering injection system will be supplied for controlling different elements in the product water of the RO plant. The metering pump will allow to control different functions such as the stroke length and percentage rate. The Chlorine Dosing System sterilizes product water. Sterilizes product water by alternating the DNA structure inside bacteria. Sterilizes product water by burning off the outer membrane of bacteria. 1. Membrane Housing: corrosion resistant, fiberglass construction, or 316 stainless steel. 400psi or 600 psi. 2. Membranes: Dow Filmtec or Fluid Systems brackish water, TFC membranes. stainless steel. Grundfos, Tonkaflo or others. 8. Water quality monitor: brackish water and product water digital TDS meter, brackish water and product water pH meter, ORP meter. Ashcroft, Marshal, Signet, Fisher or equivalent. 10. Pressure Gauges: on the inlet and outlet of every filtration stage, and before and after each RO membrane vessel. PLC control to provide start/stop, sequential, and alarm control. 6. emergency shut-down button pushed. Includes high flow pump, 316 SS, heater. It cleans membranes when needed, extends membrane life. Use chemicals for cleaning. Automatic cleaning/flushing. Installed with automation, valves. Etc. With common service tank for product/cleaning/flushing. The cleaning system has pressure transmitter at In/Out of each membrane vessel. If Delta P is greater than design Delta P, then audio and visual alarm will trigger.